Switching key elements of the training strategy in your business from traditional delivery methods to e-learning can deliver significant benefits. This includes a substantial return on investment. However, none of this is guaranteed simply by adopting an e-learning strategy. 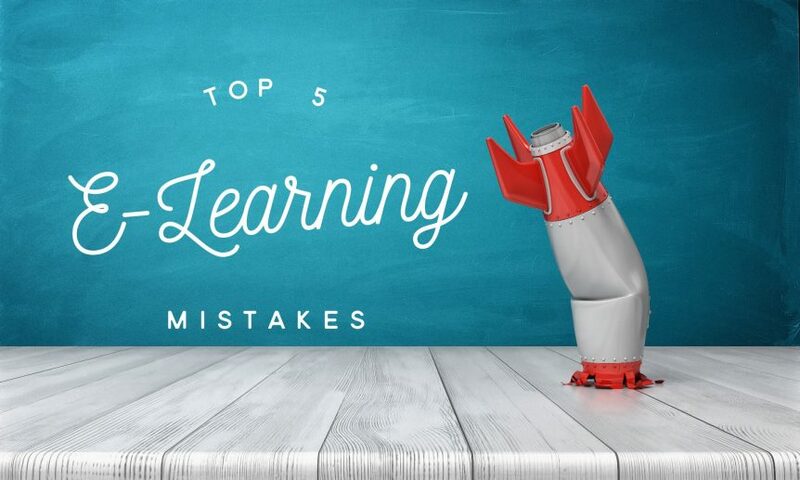 In fact, there are five crucial mistakes you can make with e-learning that will reduce the benefits you receive as well as the return you can expect from your investment. Developing e-learning in-house is entirely possible and many companies do it successfully. However, doing so involves more than getting a Learning Management System and training a member of your team on how to use it. Without all three, your e-learning course will not deliver to its potential. So, if you don’t have all three key skills in-house, you really should outsource the development of your e-learning course. Now, we would say that, wouldn’t we? After all, we are an e-learning course developer in Dubai that covers the wider Gulf region. However you cut it, though, developing any sort of training requires an investment. This applies to e-learning, classroom-based training, creating training manuals, and more. Therefore, developing e-learning in-house also involves making an investment. The fact is, your focus should always be on the return you get. As a result, you should outsource e-learning development if you don’t have the three skills outlined above in-house. Without clear objectives, e-learning courses become disjointed, they can include off-topic content, and they can become confusing. Plus, it is much harder to analyse success and return on investment when you can’t measure results against an objective. Therefore, make sure you have clear objectives. One of the main benefits of e-learning is the customisation possibilities. Providing you design the course properly, you can customise down to very specific levels such as job roles, departments, geographical locations, etc. You can even customise down to the individual. An example of this is building in flexibility to the course design where learners each follow a unique path based on their knowledge and skills rather than making the path linear and rigid. Customisation is beneficial because it makes the course content more relevant to the learner. This encourages engagement as well as helping people learn, i.e. when learners know how the content relates to them and how they can use it in their day-to-day tasks, they are more likely to grasp the material. Not having elements within the course specifically designed to engage the learner and make the course more fun. Examples include gamification elements and interactive elements like quizzes. The final major e-learning mistake that people make is not thinking about training and e-learning over the long-term. For example, in almost all cases, an e-learning course should become an asset in your business. When you develop it properly, you can update, add to, and refine this asset over time to keep it relevant and ensure it continues to deliver. This is very different from taking a one-off investment approach to e-learning where you create a course, put learners through it, and then never go back to it. Another example of a long-term e-learning strategy is adopting a just-in-time approach to specific aspects of training in your business. This is where employees learn about a topic when they need to. The main benefit of this approach is motivation, i.e. employees in this situation will be highly motivated to learn. To achieve it, however, you need a library of e-learning courses and materials that learners can dip into whenever the need. This requires a long-term strategy. By thinking long-term, you will continue to get a return on your e-learning investment. The summary of the above is you need to have a clear strategy to make e-learning work for your business as well as an approach that focuses on return on investment. When you do, you will achieve greater success not only with the e-learning materials you develop, but also in your company training efforts overall.